Storm Collectibles presents the Street Fighter V Zangief Special Edition 1:12 Action Figure! Zangief is one of the most popular, iconic, biggest and most powerful characters in the Street Fighter series. Zangief's fighting style is a mix of Russian and American pro wrestling including his iconic move; the Cyclone Lariat and the new critical art in Street Fighter V, the Bolshoi Russian Suplex. 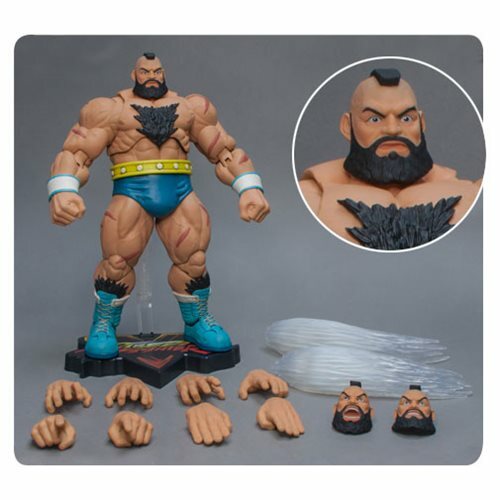 The Street Fighter V Zangief Special Edition 1:12 Action Figure includes 3x Interchangeable Head Sculpts, 5x Pairs of Interchangeable Palms, 2x Cyclone Lariat Effect, 1x Stand with the Street Fighter V Logo.